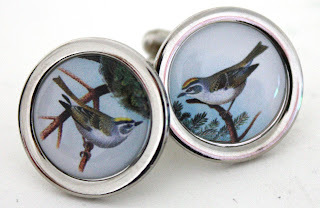 I'm currently working on ideas for cuff links - including a range of very cute vintage birds. As well as original and vintage designs I also have lots of 'one offs' made from recycled comic, books and other papers. I only sell cufflinks at craft fairs at the moment but hope to be stocking in my online shop soon.